Three opinion pieces on US policy toward North Korea have appeared in the New York Times in the past week. They deserve critical comment. The writers are all very capable people who share a deep concern about Korea’s security and the possibility of a major blowup that would cause enormous human and material losses throughout the Asia Pacific. As a longtime student of Korean affairs, however, I find that these commentaries—which reflect analysis in the US mainstream media generally—are narrowly focused and alarmist. They would make it seem that, like climate change, we are doomed because “the situation” has entrapped us. This is a lousy option, though perhaps not for the reason Kristof thinks. Though North Korea certainly wants to keep its nuclear and missile programs, it is very unlikely to agree to freeze them under pressure from US and Chinese sanctions. It’s a case of sticks before carrots—a non-starter. The North Koreans for some strange reason don’t respond well to blackmail. Why not dispatch a high-level US emissary to Pyongyang to negotiate a freeze while sanctions are being scaled back, accompanied by other inducements (such as the promise of US diplomatic recognition and a pledge, as both sides made in 2000, of “no hostile intent”)? These three writings share a number of misconceptions. First, the sources they consult—those mentioned and those we may reasonably presume have informed the articles—are weighted in favor of evaluating military capabilities, not diplomacy. Thus, the key analytical question is not what inducements may persuade North Korea to freeze or reduce its nuclear and missile programs, and put them under international inspection, but rather what kind of punishment will hurt North Korea enough for it to surrender its nukes and missiles. Focusing on military capabilities, moreover, ignores intent: It makes quite a difference whether North Korea’s military buildup is for attack or deterrence. And if, as a number of former US officials have said, deterrence of a US attack is responsible for the buildup, that suggests a menu of incentives to provide North Korea with strategic reassurance. Second, the writers never examine any of the history of US-DPRK diplomacy. So it’s easy to dismiss negotiations as an option, as though it is hopeless to try. There’s more than a little hint here of Cold War-era “you can’t trust the communists.” Yet many in the Korea-watching community have long argued that diplomatic engagement with the North has been productive at times. The 1994 Agreed Framework during the Bill Clinton administration halted North Korea’s production of nuclear weapons for a decade, and the 2005 accord under the Six Party Talks produced an “action-for-action” agreement on political and economic issues that still has value for all sides. And let’s not forget that North Korea is not the only party that has failed to comply with agreements or undermine them with belligerent behavior. 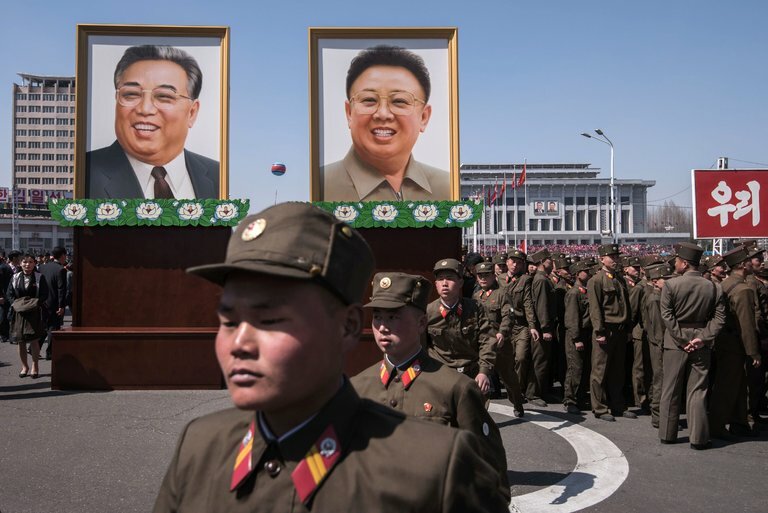 (See Mike Chinoy’s article at www.washingtonpost.com/news/global-opinions/wp/2017/04/19/how-washington-hard-liners-helped-to-create-the-north-korean-crisis/.) US administrations have consistently posed obstacles to compliance, such as refusal to restart talks until the North has given up its nuclear weapons, refusal to talk to Pyongyang without preconditions, and annually carrying out large-scale military exercises jointly with South Korea. Third, in the case of Fisher’s article, his list of presumed North Korean conditions for an agreement come from his imagination, not from examination of the record. Ending the US-South Korea alliance is no doubt a North Korean hope; but that’s not among its central demands. Even ending sanctions isn’t a condition per se. What North Korea wants is the legitimacy that comes from diplomatic recognition and assurances of regime survival, along with a peace treaty that ends the Korean War and paves the way for economic aid from the US, South Korea, Japan, and others. What North Korea would accept as conditions for those concessions can only be determined by talking with it—a subject neither Fisher nor any others entertain. It is hardly surprising, then, that a stalwart of liberal reporting such as the New York Times provides deeply pessimistic accounts of prospects on the Korean peninsula. Instead of offering a perspective that takes engagement-minded diplomacy as its starting point, the Times articles look at worst-case futures. To be sure, the word “negotiations” does appear in these commentaries, but without serious interest in them. We are thus left to throw up our hands and surrender to the inevitable: Trump’s threats, which the Times authors find dangerous but unable to get beyond. Strange that the Times laments the evisceration of the State Department and sidelining of its top leadership, yet fails to connect the dots to North Korea policy. Thanks for this analysis, which seems right on the money to me. Somebody needs to figure out why we don’t understand — or choose not to understand — negotiation basics here. We’ve made these kinds of mistakes over and over again, believing — wrongly in nearly every case — that our economic and military muscle can get us what we want. Any thoughts on why we continue to think this way?